I have a real problem with someone in my life: Past Me. He is an embarrassment and a nuisance and I wish I knew how to handle him. He always fools around and leaves me to do the work. Past Me even thought it a great idea to go camping last February break. I made ready all the food, double checked that I and my two teenage boys were packed. This camping trip even ran afoul of Herself as my wife worried about the temperature. I eventually had to gracefully accept her input and postpone the trip. This week during April break the boys reminded me of Past Me’s promise and cowardice. I smoothed things over by letting them pick a day to spend in the woods. Once again I was planning and looking after Past Me’s task. Since he had already packed, I just grabbed the bag and the boys and I set out on the day they chose. Our early morning departure looked good, and it looked like the weather forecast would be right about today being the only day of partial sun and not rain this entire week. The only downside to the plan would be the outside chores neglected in our absence. Past Me had promised Herself a day of outside cleanup. The good day turned bad in several ways. 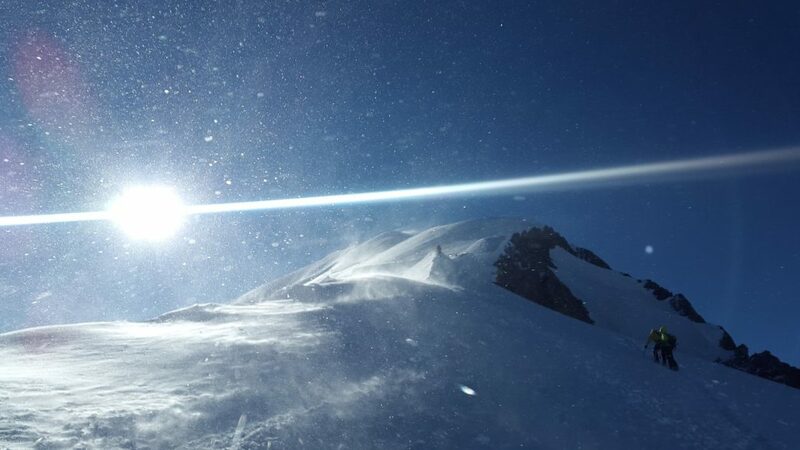 As we hiked to camp, an azure sky turned leaden. Gusting winds then thwarted most attempts at fire. Fleas, thousands of flocking fleas, made my sleeping on the ground not an option. Poor planning left us extra time which turned into a cold, windy walk. Food, started in the kitchen, failed in the field. An impending, frigid, sleepless night loomed as we huddled by our finally started fire. Later, around that same fire, I realized my focus on the negatives was wrong. Our day contained all the fun parts of camping. Full packs and all, we had hiked and enjoyed it. We had tamed the wilderness to set up camp. We had overcome failure of the lighters with an emergency kit, my sleep system problem with an extra hammock, and our poor food choices with some good nature. We had wandered packless through the nearly springtime forest, played in streams and made pine mint tea (mint leaves we grow at home are always in my mess kit and the pine needles we picked made a welcome addition.) A safe, basketball sized fire completed our camp, with its small size made effective by adding flat rock reflectors and our microclimate tarp. We had also talked and ate and sat ourselves to that comfortable peaceful silence I love about family. So, I suggested to the boys we could go home. This could be a new thing: theoretical camping. Camping joy without suffering the eternity of cold darkness until morning. We were only ten miles away, had experienced the best parts of camping and we could work tomorrow on the projects that were needed around the house. We could also, I added, get candy bars on the way home. Neither of them needed convincing past that, so we packed up camp. When we got home I had candy bars for everyone and all my wife said in the way of, “I told you so,” was “So you couldn’t stay away?” The smell of campfire hung about me as I nestled into the couch. I alternated between finishing a Snickers and dozing through a famous actor’s terrible British accent (he was singing some drivel about chimney sweeps, I think…) I also slept great that night. Next day, as I was taking advantage of beautiful weather to work in the yard, it occurred to me that Past Me had finally done something right. He had shown discretion and coined a new hobby of theoretical camping, camping without the missing home part. So some things can change. But then it dawned on me that some things never do. He had messed about in the woods while I was stuck doing all the hard work at home. Eating and drinking outside are some of my favorite parts of being in the woods. I love a fire but in many places one cannot have an open fire. 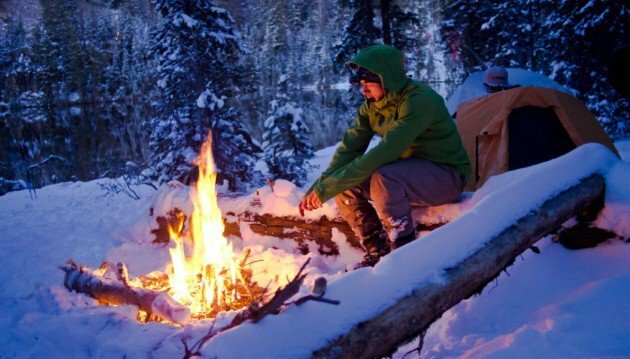 Without a fire, the easiest way to make water safe, to heat coffee or cocoa or to make food in the woods is to use a small camping/hiking stove. These stoves can be expensive – my favorite cost me $80 – but well made stoves can be created at home from common items and are as efficient as commercial stoves. Read on to learn how to build a stove to heat food, from the can the food was purchased in. Last school break I commandeered the kitchen table and retested all the various stoves I have made. “Past me” thought them all clever at the time, but “present me” is finding the sheer numbers a trifle excessive. Most are made from food/drink cans, because “past me” did not want to buy an expensive store-bought model. All can be put into one of three basic categories: solid fuel burning, liquid fuel burning and wood burning. Solid fuel burning stoves burn fuel tablets. I saw some in town in the camping aisle, and a quick internet search yielded many results, like Coghlan’s Solid Fuel Tablets (72 pack for $15.) I have some fuel tablets in a small baggie in the bottom of my pack because they are light to carry and could be put in the bottom of any empty can to be burned. I never got into the habit of using them as a primary source of heat because I was more interested in making stoves that burned liquid fuel. I carry them now for that time when the liquid fuel runs out on trail or to start a fire in extreme weather. An example of a homemade stove, from Pinterest. Liquid fuel stoves are an easy build and there are plans everywhere online. (The one pictured came from the Pinterest website.) They are also just plain fun to make and use. You have many options to fuel such a stove, from Everclear (an alcohol of 151 to 190 proof) to Naptha (the off-brand version of the fuel used in zippo lighters). For my stoves I use HEET, the gas line antifreeze that draws water out of your car’s fuel system. It can be bought at most gas stations, burns cleanly and is inexpensive. It is easy to make a simple stove of your own. Remove the top of an empty aluminum drink can and use a hole punch to make holes at even intervals around the top third of the can. Fill the bottom third with liquid fuel. After setting the fuel alight, wait a couple minutes to give the stove a chance to heat up. Put your kettle on the can, making sure to cover the top of the can with the bottom of your kettle. The heat in the stove will turn the liquid fuel to gas which ignites and exits the holes just like the flame of a gas stove. If you put the kettle on your stove and it goes out, it was not warm enough and you need to let it burn longer before putting the kettle on next time. Be sure to shield the stove from the wind, and it will work great. I have since moved from using any old can because those designs had no way to extinguish the stove other than allowing it to run out of fuel. The missing piece was a cover that would cut off the oxygen of the burner. What was needed was two cans, one slightly smaller than the other so that I could use the larger to cover the smaller. So I went to Hannaford and grabbed cans, going from aisle to aisle comparing sizes. I found that a Vienna Sausage can fits inside a small tomato sauce can nicely which makes the Vienna Sausage can the burner and the sauce can the cover that extinguishes the stove. When possible, a small fire is my favorite pastime in the woods, and my cooking method of choice. However, careless use of fire and a need to protect our common land has changed the public opinion of open fires. The result is that sometimes you cannot have a fire. Those times are why I always carry what is called a wood gas stove. A wood gas stove has a center that is very efficient with fuel so its only fuel is twigs and sticks. It burns in a way that forces the fire’s smoke to be recirculated in the stove, meaning the stove burns without smoke once it comes to operational temperature. Since it is a stove, it can be used where an open fire is illegal. And since it burns small sticks one does not need to carry large amounts of firewood or worse yet, harvest large amounts of any wood. I pick up pencil sized sticks along the way and those, plus an occasional small branch, are enough fuel to run the unit. My stove is a Toaks titanium 750 ml pot and wood stove combo set which I bought because pot and stove nestle together, taking up small space in pack. 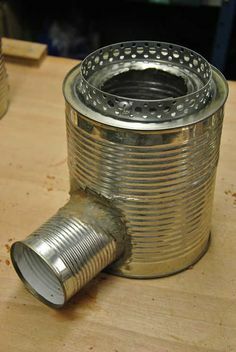 You do not have to buy such a stove, because a simple wood gas stove can be made with two cans, one smaller than the other. The smaller is the burn chamber: punch holes in the bottom of the can and a ring of holes around its top rim. The larger can only needs its top removed, a ring of holes punched around its top rim and a hole the size of the smaller can cut in its bottom. Put the larger can upside down on the table, and put the smaller can, bottom first, in the hole in the larger can’s bottom. Fill the small can with twigs and set it alight. After a minute of burning you should see the smoke no longer leaving the stove, but rather being pulled back in to be burnt again. If that last paragraph was too much, you can get a great tutorial on YouTube in a minute of searching. All three types of stove mentioned above are easy to use, to make and to fuel. The first time you fire up one of your stoves, it needs to be done in the open air. Burning reused cans releases a noxious gas the first time burned. After the first burn the can is safe and you can enjoy the use of your homemade stove. Making and using a stove you have made will satisfy that need to be self sufficient and have a cost effective way to replace broken equipment in the field. And being self sufficient while saving money and looking clever is a great way of messing about in the Maine woods.